at the 2012 Summer NAMM show in booth 1703. Stompblox are modular pedal boards for guitar effects that allow players to expand their pedalboards simply and cost effectively, customizing the layout of their pedalboard in a manner that works best for them. Stompblox modular pedalboards will be available in mid October, 2012. Guitar players who use effect pedals often have more pedals than they have room on their pedal boards. When they run out of space, they typically have two options. They can buy a new pedalboard, which can be costly, but are then faced with what to do with the old, smaller pedal board. Or they can decide which of their favorite effects they can do without. With Stompblox modular pedalboards, players don’t have to make that choice. When they need additional space, they can add another Stompblox module which easily slides and screws into place, expanding the space they have to mount effect pedals. The concept was invented by brothers Paul Swanson and Andy Swanson after purchasing effect pedals that didn’t fit on their already full guitar pedalboards. Faced with the decision to leave off a pedal, or to buy a bigger pedalboard at a significant cost, they decided there had to be a way to offer musicians a pedalboard system that grows as their pedal collection grows. After developing the modules and applying for patents, the Stompblox modular pedalboards are slated for a Q4, 2012 release. “The fantastic thing about Stompblox is that players can continue to add modules as they need them. Additionally, players can now make a pedal board configuration that works for them, whether rectangular, L, or U shaped. 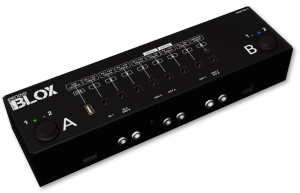 Stompblox modular pedalboards allow for a level of customization that hasnt been possible until now,” says Andy Swanson, President of Renovo Amp Works and inventor of the Stompblox concept. Renovo Amp Works will be showing and demonstrating Stompblox modular pedalboards and boutique guitar amplifiers at the Summer NAMM 2012 show, in booth 1703. Stompblox modular pedalboards are currently scheduled for a mid October 2012 release. Renovo Amp Works is a Pismo Beach, California based company that builds boutique guitar amplifiers, effect pedals, and Stompblox modular pedalboards for guitarists and musicians that use floor effect pedals. Renovo Amp Works is a privately owned LLC established in 2009. For more information on Renovo Amp Works, please visit www.renovoampworks.com. For more information on Renovo Amp Works or Stompblocks modular pedalboards, please contact Andy Swanson at 805/703-4596 or email Andy at pr@nullrenovoampworks.com.